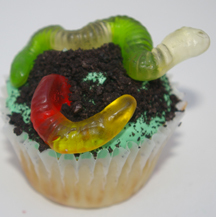 Kids love these creepy, crawly cupcakes that are super easy to make. What You Need: 1 cupcake; frosting (green or chocolate); 2 gummi worms; chocolate sandwich cookies (such as Oreos). This entry was posted on Wednesday, March 5th, 2008 at 10:10 am	and is filed under bug and spider cupcakes. You can follow any responses to this entry through the RSS 2.0 feed. Responses are currently closed, but you can trackback from your own site.